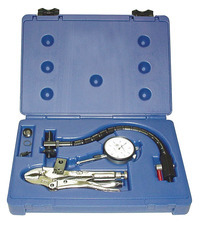 Central Tire and Wheel Run-Out Gauge Set features a range of 1 in, graduations 0.001 in and reading 0-100. It checks on tire and wheel run-out, brake rotor run-out, ball joint wear and large radiused contact checks radial run-out. It comes with 6 in extension that provides additonal reach and the roller contact checks wheels and sidewalls. Flex-Arm makes indicator positioning easy and special clamping pliers attach securely anywhere on balancer.